Grab your July/August 2015 issue today! Get your smartphones ready, discover ways to style your food and follow our tips on creating your food images for your social media pages. Hot Off The Press, It’s the latest issue of Great Taste Magazine. Grab your July/August 2015 issue today and get your smartphones ready. It’s time to discover ways to style and photograph your food. Follow our tips to create your food images for your social media pages. 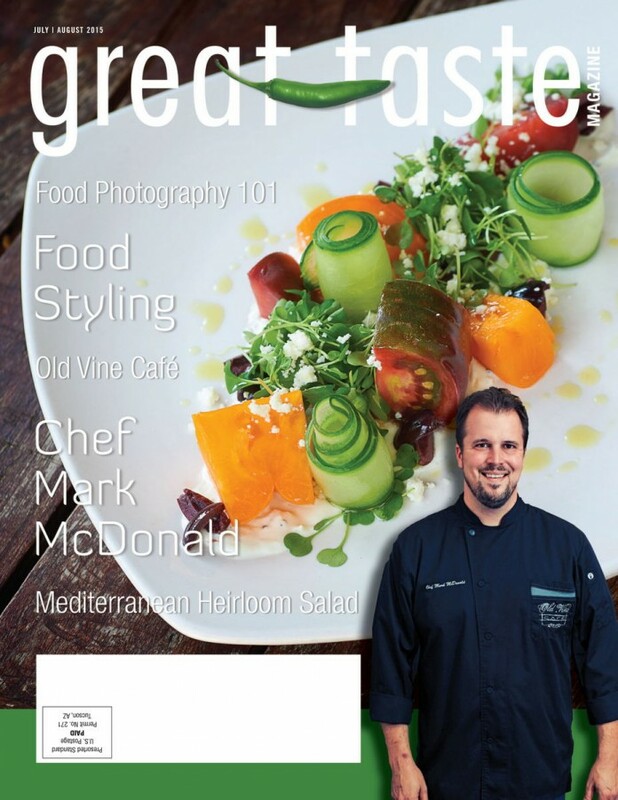 Featured on our cover is Chef Mark McDonald, owner of Old Vine Cafe. Discover what sparked his passion for cooking and where his sources of inspiration come from. Discover our Cheese Pick and Produce Pick of the Month and find out why they should be added to your grocery list. Meet new Orange County talent Andrew Monterrosa, Executive Chef at TAPS Fish House & Brewery in Irvine. Celebrate the anniversary of The Westin South Coast Plaza, Mozambique, and Cucina Enoteca. We’ve got summertime wine and cocktail recommendations too. We’ve also gathered a couple of food presentation and photography books we recommend. They can come in handy for the I’ve Got Great Taste photo contest continuing until the end of September.